Art: Any object of material composition, human action, or linguistic metaphor, perceived in its context as evoking human experience apart from verbal description. This suggests function rather than a set of intrinsic properties. An object may or may not be art depending on how it functions at a given time, and that function depends not on an artist but on the perception of the one for whom it functions to evoke human experience. Artist: One who creates objects intended to function as art. My definition of Music: Sound organized on a time continuum for appreciation of the sound, the principles of its organization, and its effects on listeners. Music may function in many different ways: as art, decoration, correlation or stimulus to kinesthetic movement, ritual act, consumer commodity, tool for behavioral manipulation, social signifier, etc. Music can be art, and a lot of other things, besides. 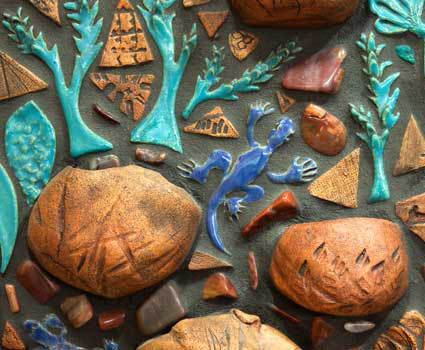 IMAGE: Niki Glen, Healing the Sprit: A Journey of Hope, detail, 2002, Phoenix Children's Hospital Chapel, Phoenix, Arizona.